Nigeria coach Gernot Rohr is over the moon about Samuel Kalu’s move to his former French club Bordeaux. Kalu was unveiled by the French Ligue 1 giants on Tuesday after the attacker dumped Belgian side Gent to sign a five-year contract to play for Les Girondins, where Rohr is a legend after playing and coaching them for years. The 20-year-old winger, who scored seven goals in 32 appearances for Gent in the Belgian Juliper League last season, has yet to play for the Super Eagles. And Rohr has hinted he could include the former Slovakia-based player in his plans for the Cameroon 2019 Africa Cup of Nations qualifiers. The veteran German manager said he was monitoring Kalu’s performances at Gent where he struck a good understanding with Nigeria midfielder Moses Simon, but did not pick the player for the 2018 World Cup in Russia because he had good players in his role. “I never selected him. I saw him play for in his team. I took another, which is Simon Moses. He has been in my group since two years ago. He is also a winger, fast. He’s almost the same, but I found him better than Kalu,” the former Gabon manager told Girondins4ever in an interview published on Wednesday . “We have many fast wingers in Nigeria. There is a plethora of quality attackers. This boy could not join our team. But now, maybe he’s going to cross a course. We’ll follow him. He added, “Samuel Kalu is a good dribbler, and he’s an overflowing winger. He’s explosive, he gives a lot of good balls. 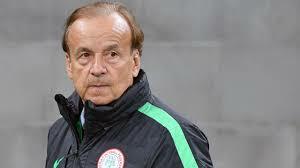 Rohr said he was happy with the Eagles’ performance in Russia despite crashing out in the group stages. He said, “The World Cup went well, because the team showed a beautiful face. It’s a young team, a team with a future. It was a team that played good football, I was happy with what they did. “They played a good match against Iceland. The first match was a little difficult, against a very nice Croatian team. Then the third match (against Argentina), a little unfortunate. We could have got a draw: I even think we deserved it.